Clipper Vacations operate the Victoria Clipper passenger ferry service that connects Seattle and Victoria with year round daily departures as well as operating seasonal crossings between Seattle and Friday Harbor on San Juan Island. 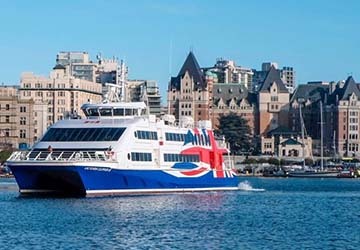 The Clipper Vacations Seattle Victoria crossing gets you between the state of Washington and British Columbia in comfort and style aboard one of the high speed passenger only Victoria Clipper ferries. The three hour crossing sails through Puget Sound and into the Strait of Juan de Fuca on the way to Victoria’s Inner Harbour, located right in the heart of downtown Victoria. For the ferry crossing between Seattle and the San Juan Island port of Friday Harbor you’ll board the Victoria Clipper ferry at Pier 69 in downtown Seattle before setting off for the three and a half hour scenic journey via Deception Pass to Friday Harbor! This service generally operates from May to September. Onboard the ferries for both routes you’ll find comfortable seats with ample leg room so you’ll have space to stretch out and relax. You can enjoy a meal basket or a refreshing beverage served right at your seat or if you want to stretch your legs then step out on deck and observe the wonderful view.